President Donald Trump tweeted on Monday morning that he spoke with Saudi Arabia's King Salman bin Abdulaziz Al Saud about the disappearance of Washington Post columnist Jamal Khashoggi. "Just spoke to the King of Saudi Arabia who denies any knowledge of whatever may have happened ‘to our Saudi Arabian citizen.' He said that they are working closely with Turkey to find answer," Trump tweeted. He added that he was sending Secretary of State Mike Pompeo to meet with the Saudi king. Earlier this month, Khashoggi, a Saudi dissident, disappeared after entering the Saudi consulate in Istanbul last week. Turkish officials accuse the Saudis of murdering Khashoggi. They also claim an audio recording captured moments of his "interrogation, torture, and killing," a Turkish newspaper reported. Saudi Arabia has denied the allegations. Trump has threatened "severe punishment" if the Saudi government is responsible for Khashoggi's death. "There's a lot at stake. And, maybe especially so because this man was a reporter. There's something — you'll be surprised to hear me say that, there's something really terrible and disgusting about that if that was the case so we're going to have to see. We're going to get to the bottom of it and there will be severe punishment," Trump said. 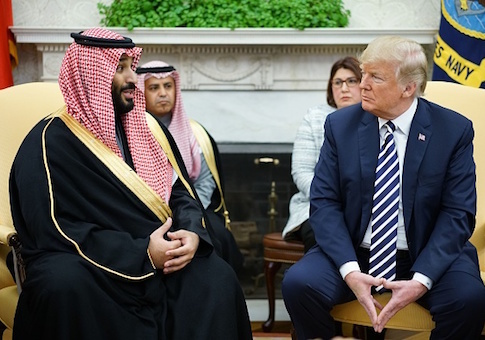 Despite issuing a threat, Trump indicated he wouldn't cancel the $110 billion arms deal he negotiated with Saudi Arabia. Some U.S. lawmakers want the Trump administration to take action against the Saudis. Senators from both political parties have called for sanctions against Saudis responsible for Khashoggi's disappearance. Sen. Marco Rubio (R., Fla.) said on Sunday that he believes the Trump administration should not continue "business as usual" with the Saudi government. This entry was posted in National Security and tagged President Trump, Saudi Arabia. Bookmark the permalink.